It was the 14 May in 1997 when Barça and Paris Saint-Germain faced each other at the De Kuip stadium in Rotterdam in the Cup Winners’ Cup final. Barça came into the match having just won El Clásico in the league against Real Madrid 1-0 with a Ronaldo goal. The match between the Catalans and the French side was dominated by the former and was decided by a Ronaldo penalty in the 37th minute of the first half. The blaugranas made the most of PSG’s N’Gotty’s foul in the area and Ronaldo slotted home his fifth goal of the competition and 45th of the season. He ended the campaign with an incredible 47 goals to his name. Barça had chances to double their lead with Figo hitting the post twice while PSG’s Loko also hit the woodwork in the second half. 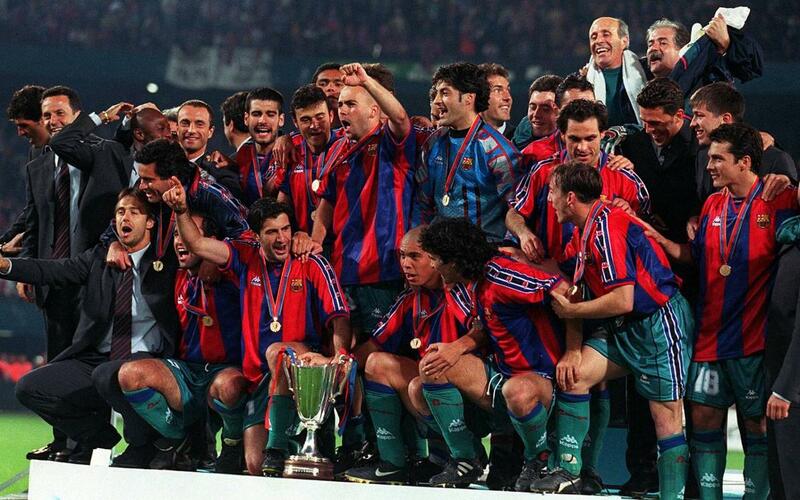 The win gave Barça their fourth Cup Winners’ Cup and saw the English manager Bobby Robson lift his second trophy, following the Spanish Supercup victory against Atlético, in his only year in charge. At this point of the season the team were also into the Copa del Rey final against Betis.